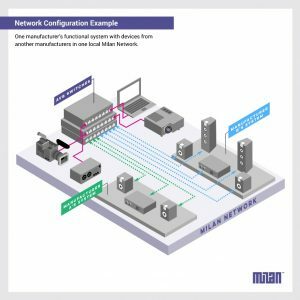 Avnu Alliance members have launched the Milan Network Protocol, a standards-based protocol “built for deterministic, interoperable, future-proof media networking in the pro AV market,” according to the announcement heading in to InfoComm 2018. Milan [short for “Media-integrated local area network”] is “a user-driven protocol for professional media, providing the guarantee that all Milan devices will work together providing a greater level of convenience, reliability and functionality,” according to the Avnu Alliance press release. Milan “builds on these features, further defining device requirements at both the network and the application layer for compatible media streams, formats, media-clocking, redundancy and controller software,” according to the Avnu Alliance press release. Milan certification “will deliver fool-proof interoperability of deterministic networked pro AV devices,” according to the announcement. Compromised system reliability and functionality problems with AVB devices led Avnu Alliance members to devise Milan, says Henning Kaltheuner, head of business development and market intelligence at d&b audiotechnik. “The adoption of AVB has been slow and there were interoperability limits,” he says. “We were running into a lot of situations where the switches weren’t available so we decided we needed to build future-proof network components and scalable solutions. “There was a motivation to collaborate that was more important than competing with each other. We needed to build our vision for the future. We’ve seen strong marketing against AVB for many years, but we’d like to educate the market a little more. We can make it clear this is the future, but this isn’t going to be a story that changes overnight,” says Kaltheuner. 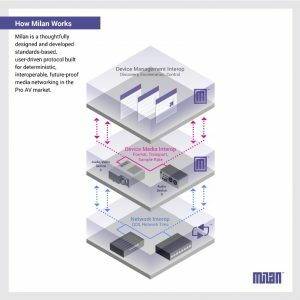 The Milan standard is open and will soon feature a streamlined certification process for manufacturers who want their products to be part of the end-to-end solution. 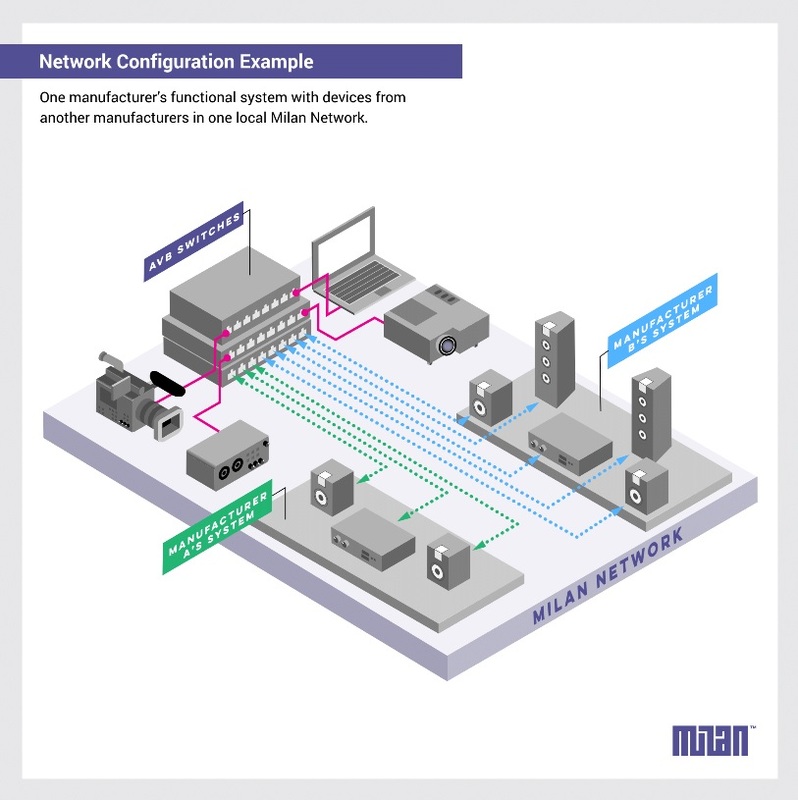 Milan features plug-and-play network setup and allows for uncompressed video at a very high bandwidth. “We began exploring this solution 18 months ago, and discovered a compelling benefit to unify our vision with Milan,” said Kaltheuner. “We knew for certain, in an industry dominated by companies that want to market products to customers, we needed to focus on the customer experience. “The user experience wasn’t good and many users were very frustrated. We believe we’ve created a network management protocol with the best user experience in the market,” he says. “There was definitely a lot of work that needed to be done,” says McMahon. Manufacturers interested in exploring Milan network implementation should visit www.avnu.org/Milan or email Milan@Avnu.org. Many members will be showing off new products featuring Milan capabilities at InfoComm 2018. “This isn’t vaporware,” says McMahon. Click here for Milan specification documents for media clocking and formats. The specification document for redundancy will be added later this month.